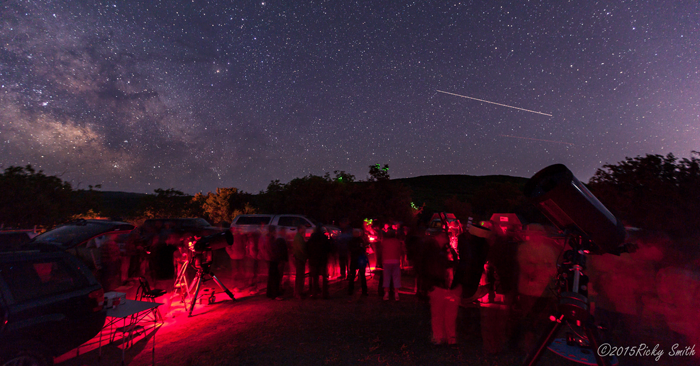 Visitors to Black Canyon of the Gunnison National Park enjoy an evening star party. Photo by Ricky Smith. MONTROSE, Colo., and TUCSON, Ariz. (8 September 2015) – The International Dark-Sky Association and Black Canyon of the Gunnison National Park are proud to announce the official selection of Black Canyon as an International Dark Sky Park. This highly sought designation means that Black Canyon has exceptional opportunities to observe dark skies and has implemented a program of dark sky preservation, education and opportunities for the public to enjoy the night sky. Beginning in 1998, Black Canyon partnered with the Black Canyon Astronomical Society in Montrose and Delta, Colorado, to present a variety of programs. Thousands of visitors have stepped up to a telescope at Black Canyon and said “Wow!” The support and dedication of the membership of the astronomical society was integral in making this designation possible. With that support, park staff and local astronomers have been working for several years to make improvements in park lighting, ensuring that it is night sky and wildlife friendly. Staff and local astronomers perform light fixture and bulb replacement, dark sky monitoring, outreach programs, news media articles and in-park interpretive programs that engage the public in the dark sky discussion and conservation efforts. The park was greatly assisted in this effort by the National Park Service (NPS) Natural Sounds & Night Skies Division, NPS Intermountain Regional Office, Colorado Plateau Dark Sky Cooperative and Western National Parks Association. A special thanks goes to the membership of the Black Canyon Astronomical Society. This endeavor would not have been possible without their expertise, commitment and support of dark skies at Black Canyon. To celebrate the new Dark Sky Park status, visitors are invited to attend astronomy programs offered on the South Rim throughout the month of September. These include evening programs and night sky viewing on September 9, 11, and 16 along with a special observation of the total lunar eclipse on September 27. Other astronomy events take place throughout the year, culminating with the 7th annual Astronomy Festival in June 2016. This includes four days of astronomy and solar programs. Sky Rangers, local astronomers, special speakers and volunteers present programs relating to the many benefits and thrills of dark night skies. For more information about Black Canyon of the Gunnison National Park, visit www.nps.gov/blca and www.facebook.com/blackcanyonnps. For more information about night skies in national parks, visit www.nature.nps.gov/night.